At the Smith Law Firm, we are committed to protecting the rights of victims and families after a serious personal injury. We understand the financial burdens, the pain and suffering, the physical limitations, and the mental toll that victims of personal injury endure. We can help you through this difficult time in your life. We also handle a variety of other types of civil litigation, including business disputes and insurance disputes. 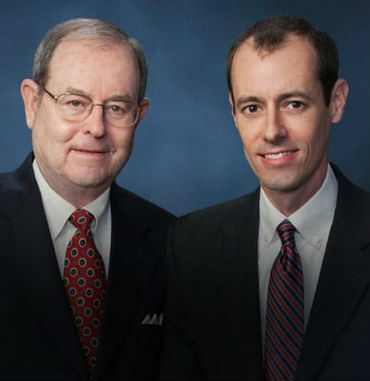 Our law practice was founded in 1967 by John Cash Smith, who has been helping injured Texans since 1964. Christopher Smith has been handling personal injury claims since 1997. Both were born and raised in Orange, Texas, and are committed to helping injured people. Both of our lawyers are Board-Certified in Personal Injury Trial Law by the Texas Board of Legal Specialization. This title is granted to only a select few lawyers. Our experience and results have also led to John Cash Smith being named as a Texas Monthly Super Lawyer and Christopher Smith being named as a Texas Monthly Rising Star Super Lawyer. Furthermore, our lawyers have held leadership positions in several Texas legal organizations, as well as local community organizations. We have a long history of achieving positive results. We have recovered millions and millions of dollars for auto accident victims and other victims of negligence. We are recognized as dedicated and skilled attorneys who truly care about getting our clients the best results possible. We have the knowledge and skills to make sure your personal injury case is handled correctly. We will work hard to help you obtain the financial compensation you deserve. Chris Smith grew up in Orange, Texas, as the son of a trial lawyer who represented people injured by the negligence of others. He learned at an early age that skilled representation in the courtroom is the difference in achieving justice for individuals and families harmed by careless drivers, medical mistakes, construction accidents, dangerous products, insurance bad faith, and other wrongful acts. Chris also understood at an early age the importance of both education and community service. He was active in the Boy Scouts of America, earning the rank of Eagle Scout in 1987. He was a member of the United States Contingent to the World Scout Jamboree in Australia and New Zealand in 1987-88. Chris traveled extensively and developed a world perspective from studying abroad. His travels have taken him to the countries of Egypt, Israel, Turkey, Greece, Italy, Germany, France, Great Britain, Ireland, the Netherlands, Belgium, Luxembourg, Austria, Switzerland, and Czechoslovakia. While in high school, Chris was active in a variety of extracurricular activities and graduated with honors. After earning a Bachelor of Arts degree in Philosophy at Baylor University, he earned another Bachelor’s degree in English at the University of Texas at Austin. At the University of Texas, he was sports editor of the Daily Texan, one of the top college daily newspapers in America and one of the nation’s largest with readership over 50,000. Chris ended his tenure at the Daily Texan as Associate Managing Editor, a position in which he supervised a 50+ person staff. After admission to Texas Tech University School of Law, Chris chose classes emphasizing litigation, torts, and consumer protection. He clerked for Gerald Eddins & Associates in Port Arthur and also at Mehaffy & Weber’s Houston office, graduated from law school and became licensed to practice law in the State of Texas in 1997. Chris has spent his entire legal career in Southeast Texas pursuing justice for those injured or killed by the negligence or misconduct of others. Chris strives to ensure that victims can obtain justice through the legal system, even when taking on the most powerful interests. He believes in safeguarding victim’s rights, the right to trial by jury, and protecting the civil justice system in America. Chris Smith is Board Certified in Personal Injury Trial Law by the Texas Board of Legal Specialization, a designation achieved by only 2% of attorneys in Texas. He is also a member of the Million Dollar Advocates, the Multi-Million Dollar Advocates (life member), Texas Trial Lawyers Association, American Association for Justice, College of the State Bar of Texas, and has been named as a Super Lawyers Rising Star three times by Texas Monthly. Chris's wife Stacey is the Activities Director for Little Cypress-Mauriceville High School and they have a daughter and a son. John Cash “Jack” Smith grew up in Orange, Texas, and graduated from Lutcher Stark High School in 1957. He graduated from Baylor University in 1961 and from the University of Texas School of Law in 1964. After briefly practicing in Austin, Jack moved back to Orange in 1966 where he has continuously been in private practice ever since. During his over 50 years of law practice, Mr. Smith has focused his practice on personal injury law, civil litigation and commercial litigation. He has tried hundreds of cases to jury verdicts and has tried cases all over the State of Texas. During his legal career, Mr. Smith has represented thousands of individuals and families injured or harmed by the misconduct of others. He has also handled numerous complex civil cases including contract disputes, insurance coverage issues, tax evaluations, wrongful foreclosures, and large property damage cases. From 1966, he practiced in private partnerships in Orange before joining the firm of Mehaffy Weber in 1981 where he was a senior partner until 2003 when he left to practice law with his son Chris. Jack is Board Certified in Personal Injury Trial Law by the Texas Board of Legal Specialization, a designation achieved by less than 2% of Texas attorneys. He has been named a Texas Monthly Super Lawyer six times and continuously since 2010. Mr. Smith has achieved an AV Rating from Martindale-Hubbell, the premier rating a lawyer can receive from his peers for legal ability and ethics. Jack has served as City Attorney for the City of Orange since 1992. He has served as lead litigation counsel for the Nelda C. and H.J. Lutcher Stark Foundation. He is past president of the Orange County Bar Association and is a fellow in the Texas Bar Foundation. Mr. Smith has made numerous continuing legal education presentations and has written articles on personal injury trial law. Mr. Smith is very active in the Orange community and in his church. He is presently a member of the Orange Kiwanis Club, is on the Board of Directors of the Lamar State College Orange Foundation, and the past Chairman of the Board for the Nelda C. & H.J. Lutcher Stark Foundation. He is a deacon at Calder Baptist Church in Beaumont, Texas. He served for eight years on the Administrative Committee of the Baptist General Convention of Texas, two years as Chairman, and is past chairman of the Board of the Texas Baptist Laity Institute. When you come to our law firm, you will be treated with respect and compassion. We provide personal attention to each of our clients. You will never have any trouble getting in touch with your attorney. We will always be available for you. You can trust that we will aggressively protect your rights and that we will take the best course of action in your case.